Linnaeus has been a bit averse to having his photo taken lately, so I was a little apprehensive about how Santa photos would go this year. 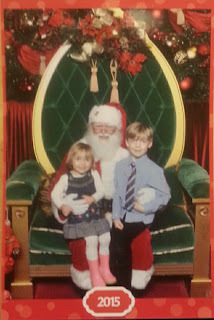 We decided to finally take the kids to Oakridge Mall, because the Santa there is not only voted the best in the city year after year, but a family friend as well. I'd heard the lineups were getting long, so we decided to go immediately after school. Though Oakridge is a bit of a jaunt--almost twenty minutes away by bike for us--it's actually not that far from Linny's school. We got there not long after three & joined a line up with five families. Bronte was her usual rambunctious self while we waited, running around under the stanchions, almost knocking several things over & nearly photobombing other families several times. After ten or fifteen minutes, our turn arrived, Santa called Linny & Bronte over by name & they ran through the gate & into a big hug. They were both on his lap in a moment & chatting with him after the photographer convinced both of them to smile & look in the right direction at the same time. The photos are adorable--though not the best quality or resolution, I have to say. The whole experience was really positive for the kids, much different from the awkward Santa visits we've had every other year at Kingsgate, Bright Nights, Lougheed, & somewhere else I've forgotten. Most likely seeing a Santa that we actually know really helped, but it's not just that. Santa Ross is really good at what he does & all the other kids--who didn't seem to know him--were smiling & enjoying their visits too. If you are still thinking about visiting Santa for photos, I highly recommend going to see Santa Ross at Oakridge Mall. He's there every day but Thursday, in the afternoons & evenings. Edit: his hours & day off varies--call ahead if you want to see if he's there. If you can get there as early as possible, there's not much of a wait. We did that yesterday too, and I thought our crummy resolution was because we had a baby (I just figured the shutter speed was super fast because babies move a lot), now wondering if it is something else. M's pic last year from the same spot is super sharp. Glad you had a good time - he really is the best Santa!